It is one of the stones sitting next to a boulder on the mesa where I was camped during my stay in the Sierra Ancha Wilderness, Arizona. I was camped on one of only a few wide promontories along one-lane, cliffside Cherry Creek Rd. 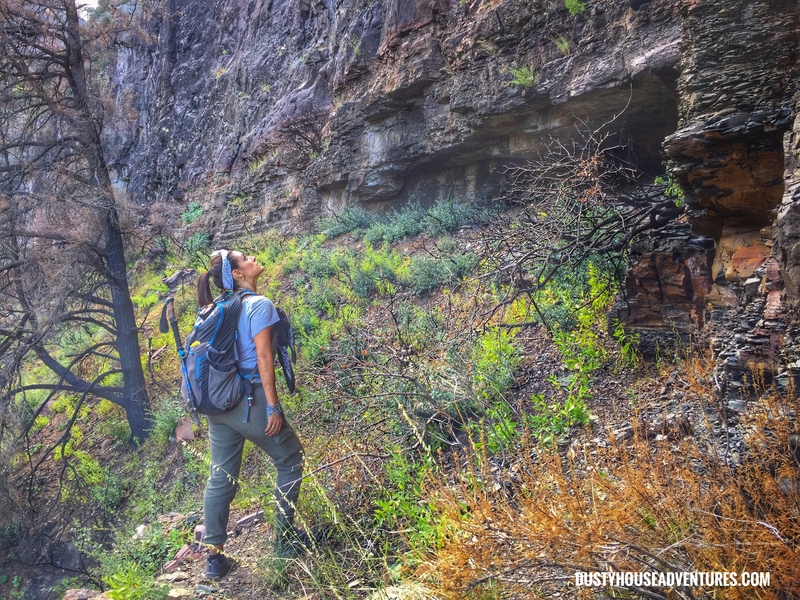 I was in this wilderness to explore the many hidden cliff dwellings left by the Native Americans of the Ancha 700 years ago and try to imagine what their lives may have been like. At my campsite I kept looking at this weird rock and trying to figure out what it could be. It looked like a brick the size of a cinder block with hollowed out cupules about four inches in diameter pocked at strange angles around its surface. The not knowing plagued me the entire visit. 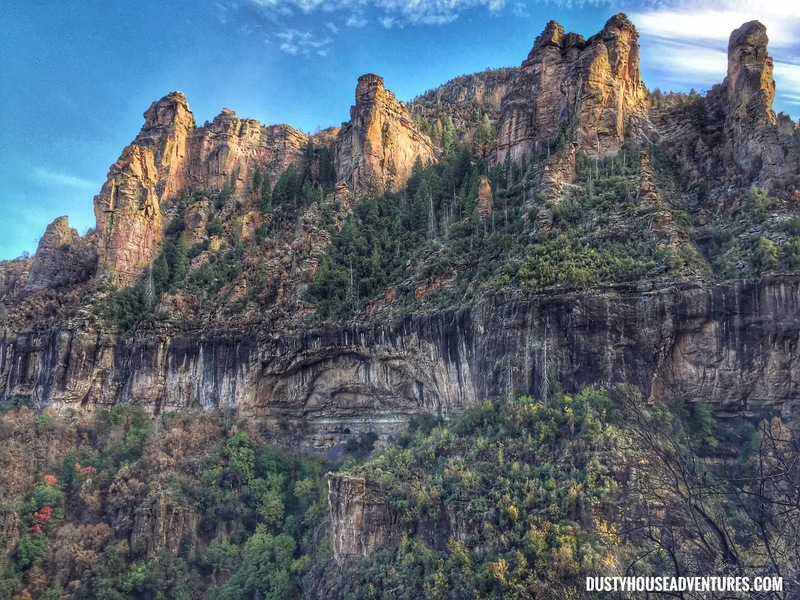 On my way out of Tonto National Forest I showed the pictures of it to three rangers and asked them about it. It stumped all of them. If you think you know what it is, don’t say, be in suspense like I was the entire trip. I’ll tell you at the end of this story. 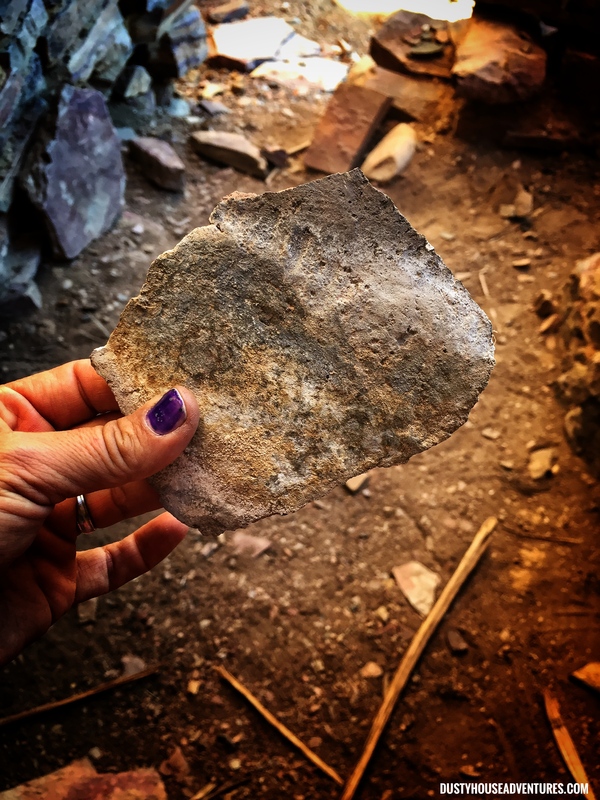 On the third day I was camped in the Sierra Ancha exploring native american cliff dwellings and pueblos I ventured up Pueblo Canyon. The previous two days I’d gone up Devil’s Chasm and Cooper Forks Canyon. Each adventure kept me out on the trail from about 10am until sundown. (I like to take my time around camp in the morning. So sue me.) By this third day I was physically tired and it was difficult to get my rear in gear, pack up my lunch and photography gear, and hit the trail. Once I’d been walking steadily uphill for about two miles I was feeling draggy and thought I’d stop for a coffee break, but OH! I forgot to bring my coffee! The horror! I’d come way too far to go back. I’d just have to pout and keep on dragging my carcass up the mountain. Pueblo Canyon runs up between the shaded south cliff and the sunny north cliff. The mountain was kind to me and gave me a break. It soon became obvious that there had recently been a wildfire on this route. When I returned home I learned that earlier this year a lightning strike caused the “Juniper Fire” to blaze along a portion of the east facing slopes of the Sierra Ancha Wilderness facing Cherry Creek. This turned out to be a blessing for me. The fire had cleaned the landscape, turning several miles of bushwhacking along a cliff into a superhighway with only patches of bushwhacking along a cliff. Honestly, with the lack of caffeine and my already tired, scratched and bruised body, I don’t know if I would have made it through a whole day of bushwhacking without breaking down into tears at least once. I got really lucky. The burn was very interesting. The thing I found most fascinating were the roasted agave plants. The leaves were pliable and waxy, like plastic. When I bent them, they didn’t crack. I think that this roasted agave leaves, aside from being used for weaving fibers and food, could well have been used to make waterproof, lightweight, plastic household items. Another interesting thing about the fire was the smell. The burned smell in the atmosphere helped me imagine Native American village life here 700 years ago. Home fires would have burned these woods every day. This is what the village would have smelled like, tangy smoke, like a combination of leather and dry tobacco. Part of the Pueblo Canyon village tucked in a cave on the South facing slope. During the 1200’s, central Arizona was densely populated. While the four corners region of the American Southwest was suffering from a 100 year drought and the top heavy “Anasazi” political structure was breaking down, central Arizona remained a fertile heartland and people flocked there by the thousands. While archaeologists notice signs of malnutrition to be common in skeletons of this era in other parts of the Southwest, the skeletons in this region do not show signs of malnutrition or osteoarthritis. 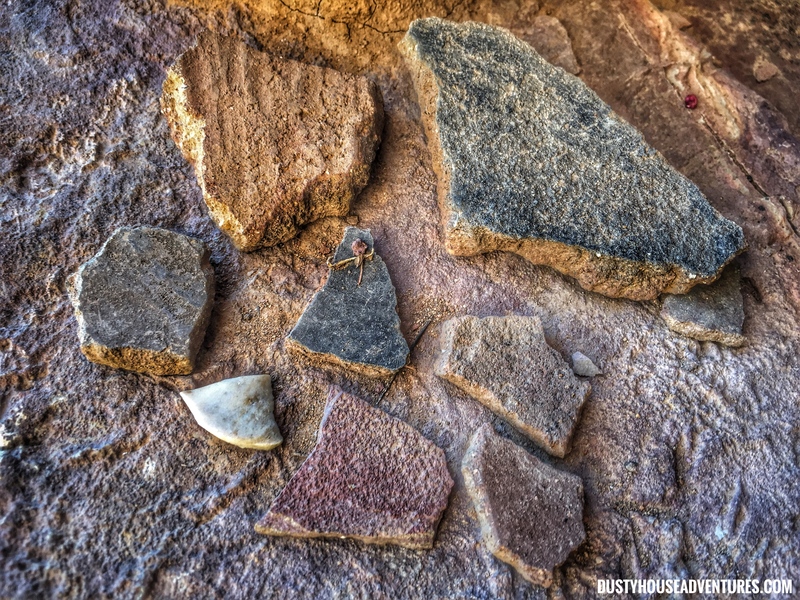 Owing to the abundance of forgeable and cultivated food and wild game, people who lived in this area of central Arizona are thought to have been among the healthiest prehistoric people in the Southwest. Small cliff pueblo on the north-facing slope of Pueblo Canyon. Again, see the steep sandy cliff the pueblo sits on? That’s the walking perilous walking route. Circular brush huts were the traditional homes of the original settlers of this same region (the Hohokam, who were irrigating the area as early as 800 AD) and it is possible that brush huts were still used by some in the 1200’s on lower flatter land, but it would have been impossible to build brush hut villages in the narrow canyons of the Sierra Ancha. Cliffside pueblos made sense given the terrain and the population density. If you were to have any doubt as to how over populated this area must have been, all you have to do is labor your way up any tributary canyon along Cherry Creek and you are guaranteed to find the ruins of pueblo villages. And if you don’t plummet to your death trying to climb up to one of the cliff dwellings you will understand that these were perched and built to be inaccessible and impermeable, a place to jealously guard your resources even if the inhabitants only lived in them part of the year. Looking behind me at the high, brush covered path I just traversed along the cliff band. To the left it is all straight down. During the mid-1300’s, as the Sierra Ancha too fell victim to drought, one by one the cliff dwellings were abandoned. Some think that the village at Pueblo Canyon was one of the last to be inhabited because it is so large. I personally counted 50 rooms (it is hard to accurately count rooms that may have already totally crumbled), but archaeologists of the early 1900’s counted as many as 70 rooms (I bet they counted the storage chambers in the back of living spaces as rooms as well). I can tell you another reason Pueblo Canyon would have been the last holdout. Water. Even today, water flows freely through Pueblo Canyon. Seeps trickle from the rock and at the head of the canyon is a perennial waterfall. The path to the village actually passes behind the waterfall. Also, despite the fact that this entire village is on a the side of a cliff, the cliff band is hollowed out for extended stretches which actually affords quite a lot of living space. There are ample outdoor areas that could have been used as courtyards. I wouldn’t propose a game of soccer in these yards, but the courtyards are certainly wide enough for dancing, outdoor food prep and craft making. This ruin is in the “suburbs” of the main village next to the courtyard in the photo above. The main complex of the Pueblo Canyon village is in three segments dictated by the landscape. At one point you have to pass through a small opening under an enormous boulder to get to the next room block. The tough passage along this south-facing slope makes you feel a little like Indiana Jones. Discovering a lost civilization (exterminated civilization *cough*) in the jungle. There are two rooms in the first block. The living spaces in these pueblos had storage chambers at the back of them like closets. I also saw these storage chambers in the cliff dwellings in Cooper Forks Canyon. I did not, however, see them in Devil’s Chasm cliff dwelling, which is one of the reasons I suspect that the Devil’s Chasm pueblo was not used as a village like these others were. I think it was a warehouse. Surly people did live at Devil’s Chasm, there are still metates in some of the rooms, but I would guess that it was a small, select bunch who remained there as caretakers, rather than a traditional bunch of ordinary villagers, but what do I know? The storage closets at the back of rooms have dividers. Compare them to the ones at Cooper Forks, they are the same. My foot at the bottom of the image gives scale. I counted 21 rooms and 26 rooms respectively in each of the next two blocks of the compound. See how the room at the back, in the photo below, has a doorway filled in? The filled in doorway would have been the original exit to the room block, but it was filled in, then they added on more rooms, and created a new, duplicate exit in the add-on. This is going to knock your socks off. I was having a great time looking around the ruins, taking pictures, letting myself be overwhelmed by the beauty of the canyon and the prehistoric construction. I was also feeling tired and concerned about the lateness of the day. I didn’t even notice that I’d photographed some pictographs on the inside of one of the apartments. Only after I’d gone home and read up on historic excavations of the Pueblo Canyon ruins did I even know there were pictographs there. Once I saw photos of them online I rushed to my pictures to find the room depicted and I had it! On the lower half of the wall of this room are white pictographs of human shapes (anthropomorphs) standing next to each other. They’re about two feet tall (really big as far as pictographs go). Its kind of strange to me that they painted the inside of a dark adobe room. Is it possible that the room was already ruined when it was painted by later people? These pictographs were first documented by archaeologist Emil Haury in 1934 so at least I know they aren’t modern graffiti. Pictographs of human shapes behind the support beams on the wall. During my visit I did see and photograph some red lines and zig zag patterns that were painted on the rock wall at the back of one of the rooms. 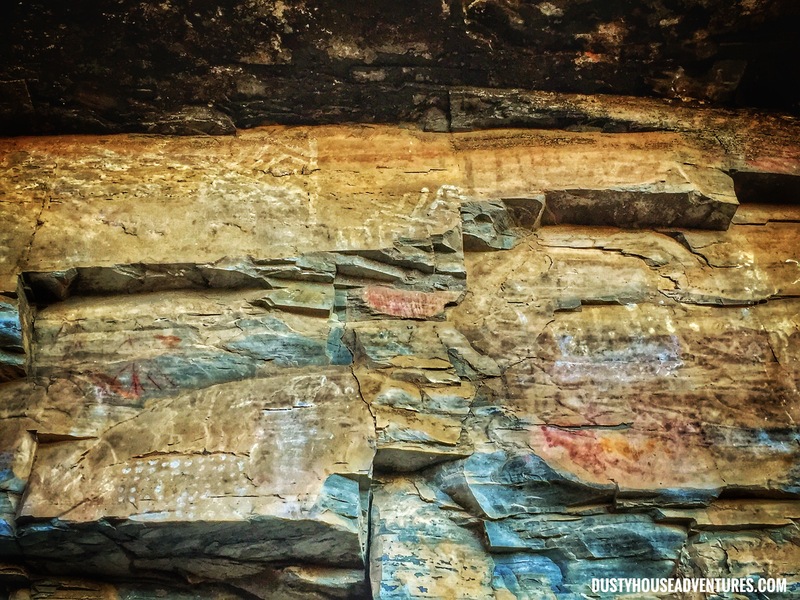 These may have been amongst the three pictograph panels in Pueblo Canyon that were documented by Haury in 1934. Here is something else interesting. It is a leaf that fossilized a stamp of itself onto a shard of rock. After a long day, Pueblo Canyon and the secrets of its lost civilization were behind me. trail near my house thinking over my adventures and pondering what that weird clay-looking mystery brick was at my campsite. Then, like I was hit with a flash of inspiration, I just knew! It came to me suddenly and I have absolutely no idea where in my brain this weird piece of information was hiding or how I knew it to begin with, but there it was. The mystery rock was, A SALT LICK! Cattle range throughout the landat Cherry Creek Canyon, drinking freely from the creeks, grazing, and adventuring up canyons. The ranchers obviously toss these salt blocks around here and there to make sure the cattle have a source of the minerals they need while wandering far from home. At least one mystery was solved among the many one ponders on a great prehistoric history tour of American Indian country. Ancient ruins, artifacts, fossils, and historical remnants in the vicinity of this notice are fragile and irreplaceable. The Antiquities Act of 1906 protects them for the benefit of all Americans. on the lands of the United States is subject to arrest and penalty of law. Permits to excavate or remove artifacts can be issued only to recognized educational and scientific institutions. The fine for damaging an archaeological site is at least $250,000 and possessing an artifact stolen from an archaeological site is a felony. That said, hike and ENJOY! See, if you had just tasted it, you would have figured it out right away. That will be my new thing. Tasting unidentified objects. Good idea! Excellent Report…. 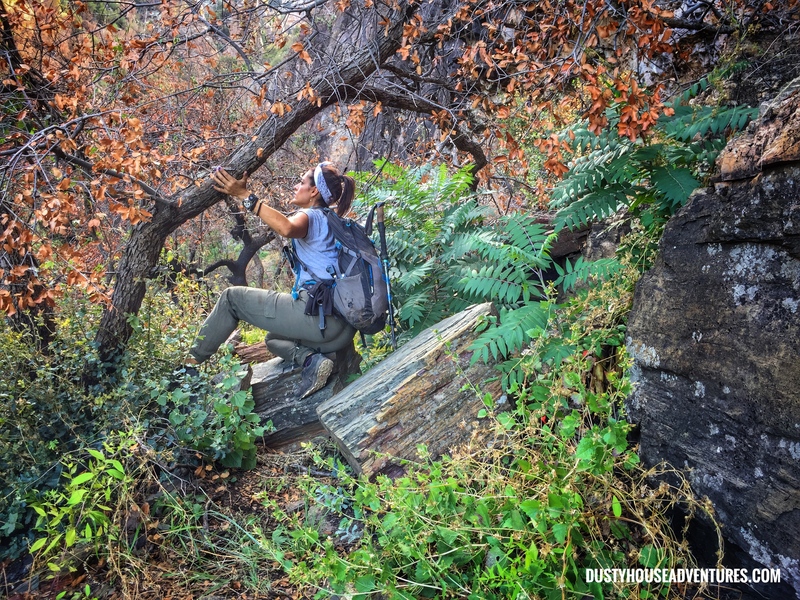 do you hike alone? I would be worried about falls and rattle snakes. Thanks a lot and the info is most appreciated!!! I remember walking around abandoned mining tunnels in the California Sierras.. (as a 17 and 45 year old guy). Not the wisest thing to do but fining a wooden box with ore samples still in the box was very interesting. Like in 1900, the miners just… left. And with any Western ghost town, a plethora of condensed Milk Tin Cans…. miners/town folk just loved coffee and condensed (sweetened) milk with their coffee. Thanks for the note and the fun remembrances. I very often explore alone. It isnt necessarily by choice, but because I usually end up going at the last minute mid-week when I get free time. I am a Wilderness First Responder and have a locator device, so I definitely have safety in mind. I do really like the flexibility of traveling alone, but there are risks I avoid alone — splunking in old mines would definitely fall into that category!